Lolcats have taken over the Bible, so is it surprising that they’ve invaded the most famous dictionary in the English language? 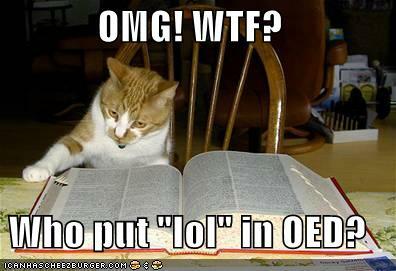 They really need their own multi-volume dictionary–Teh OLD (Oxford Lolcat Dikshunaree). This entry was posted on Monday, April 25th, 2011 at 6:19 pm and is filed under fun, language/linguistics. You can follow any responses to this entry through the RSS 2.0 feed. You can leave a response, or trackback from your own site.